In August 2011, the crash site of Avro Lancaster PD309 was excavated by a team led by Nicolas Clinaz. This Lancaster crashed near Gembloux in 1945. After clean-up and investigation some of the parts recovered are now stored at BAPA’s workshop. 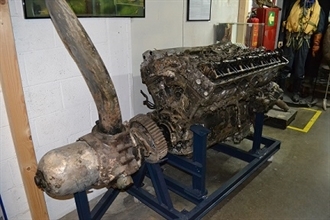 One of the Merlin engine has been installed on a dolly for display. In the early morning of January 17, 1945, Jean Albert (9 year old) contemplates a huge smoking crater in the meadow along the family farm of Sart-Risbart (Belgium). It is the fall of an allied bomber, narrowly missing the farm that ravaged this peaceful meadow. A US military platoon came to the crash area. After a brief survey of the wreckage, they went away never to come back. Rumor said that the crew jumped from the burning plane around Jodoigne. This wreck was largely exploited by scrap dealers, but they never removed large pieces and deeply buried debris interfering with agricultural activities. The wreck remained buried in the clay of Brabant, and in the collective memory, for more than sixty five years. In 2010, Jean Albert (now 74 years old) contacted Nicolas Clinaz, following a report, by a local TV station, about the search of an airplane wreck in Vellereille-lez-Brayeux. He proposed to come recover the wreckage and thus clean once and for all his field of this cumbersome War vestige. Two surveys allowed to identify the wreckage as a British four-engine Avro Lancaster bomber. Research in the Royal Australian Air Force archives provided its exact identity: Lancaster Mark I, PD309, of the 576 Squadron RAAF lost to Hamm on January 17, 1945. The coordinate of the crash was even provided in official documents: a small correction allowed a perfect match with the town of Sart-Risbart, Belgium. Research conducted in United Kingdom and Australia provided a more detailed account about Lancaster PD 309 and its last mission. A correspondence with the children of the pilot is even established. On January 16, 1945, 18 Lancaster of the 576 Sqadron based at Fiskerton are prepared for a bombing mission. More than 5 tons of bombs are loaded in their bomb bays (1 cookie of 2 tons and 12 bombs of 250 kg) in order to destroy a synthetic fuel refinery at Zeitz-Tröglitz, near Leipzig. More than 500 four-engined bombers take part in this mission. Amongst the Lancasters there is "UL-W2" serial PD 309, a veteran of 46 missions. The Flight Officer Clarence Roy PEGG, an Australian of Queensland, is already well experienced 'Captain', like the rest of his crew who counts an average of 25 missions. If the crew is mostly Australian, the flight engineer is British. The top gunner, a Jewish born in Poland, naturalized in Belgium shortly before the German invasion. Historian, journalist and writer, Ainsztein Rubin (1917-1981) will devote his live to the study of Jewish persecution during World War II. He worked for the BBC and Reuters. PD 309 takes off at 17:45 under cloudy skies. During the flight to the target, the inner left engine (# 2) was damaged for some reason and cut off. Despite a gradual decrease of the altitude, the pilot continued the mission and bombed the refinery from an altitude of 13,000 feet. 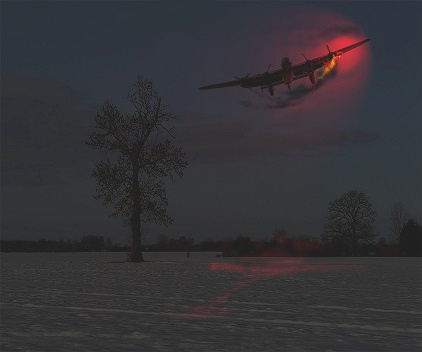 Illuminated by searchlights, the bomber was hit by the flak. The damaged outer left engine (No. 1) has to be shut down. The pilot tried to reach the liberated territories but the damaged Lancaster is difficult to control (the two left engines are damaged) and start losing altitude. F/O Pegg then decided to restart engine #1 to stay at 8,000 feet; shortly afterwards engine #1 caught fire. The extinction drill is properly executed by the pilot, at the same time avoiding an additional loss of altitude. An attempt to restart the engine #2 failed and it exploded, projecting shrapnel in the fuselage. At this time, the navigator estimated their position near Brussels. The evacuation order is given at 1:20. Two airmen parachuted when the external right engine caught fire because of the excess power applied from the target. F/O Pegg maintained the Lancaster a few critical seconds to allow to the evacuation of the rest of his crew. The Lancaster now out of control, the pilot evacuated his trusty PD309 ... only 300 meters from the ground! The crash investigation report is full of praise about the effectiveness and consistency of the crew. Furthermore, the persistence of the pilot to continue the mission despite engine damage is highlighted. The exemplary behavior of the crew is at the basis of the fulfillment of this ultimate dangerous mission. F/O PEGG received the Distinguished Flying Cross for his courage and determination. Clarence Roy Pegg was born in September 30, 1914 in Bundaberg, then a tiny village of Queensland. The young Clarence willingly helps his parents in the family cane sugar farm, and particularly liked mechanics. He married in 1937 and operated a garage before his engagement in the RAAF. F/O Pegg performed a tour of operation in Europe. After WWII, he managed a Mobil garage in Brisbane. His children marveled at thee souvenirs he brought back from Europe, the Caterpillar pin, silk card, cap, etc. without ever really knowing about the vicissitudes of their father. Discreet Hero, Clarence Roy Pegg died October 2, 1991.